Since we’ve been married, we’ve lived in a cute little cottage and an upper level of a home. Because they were both above ground, we never really experienced a huge bug problem (besides box elder bugs in the summer of our second home). It wasn’t until we moved into a basement this last summer that I really experienced a big problem. S P I D E R S.
Oh my goodness, they were everywhere. We tried every thing we could think of that was natural and non-toxic (diatomaceous earth, peppermint spray, etc…) but nothing was really working. 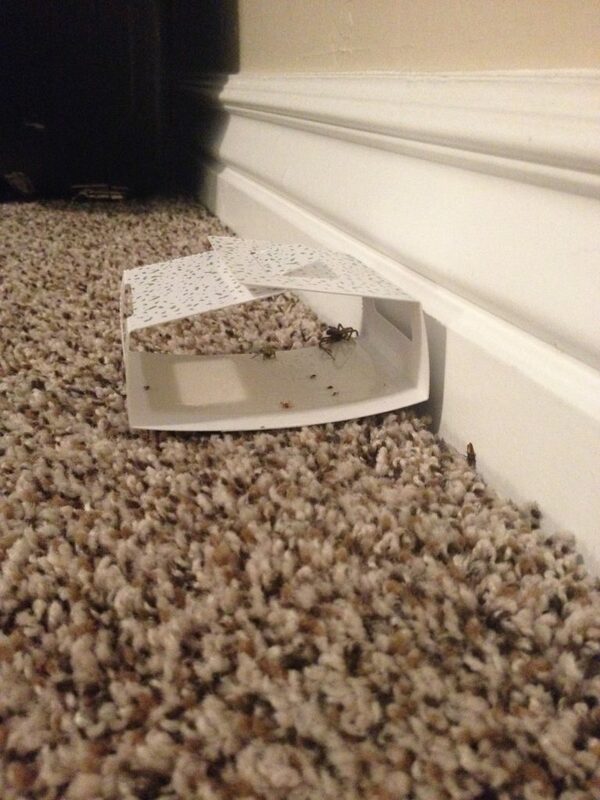 We set out traps very similar to these, which worked amazing at catching them… We set 2 of these traps in each room. EEK! I get the chills just looking at it. You guys, this is a picture of one of our milder traps. 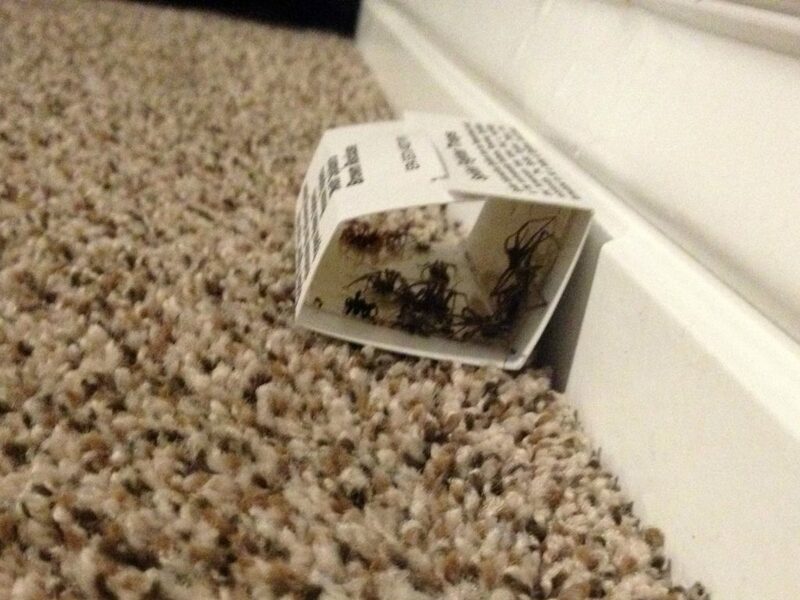 I had SIX of these bad boys in just TWO rooms and a few of the other traps had 2-3 times more spiders!! This picture was taken about a month after I set up the trap. You would think I’d be happy with all the spiders we were catching, but seeing just HOW MANY were in the traps made me feel queezy on how many we weren’t catching. 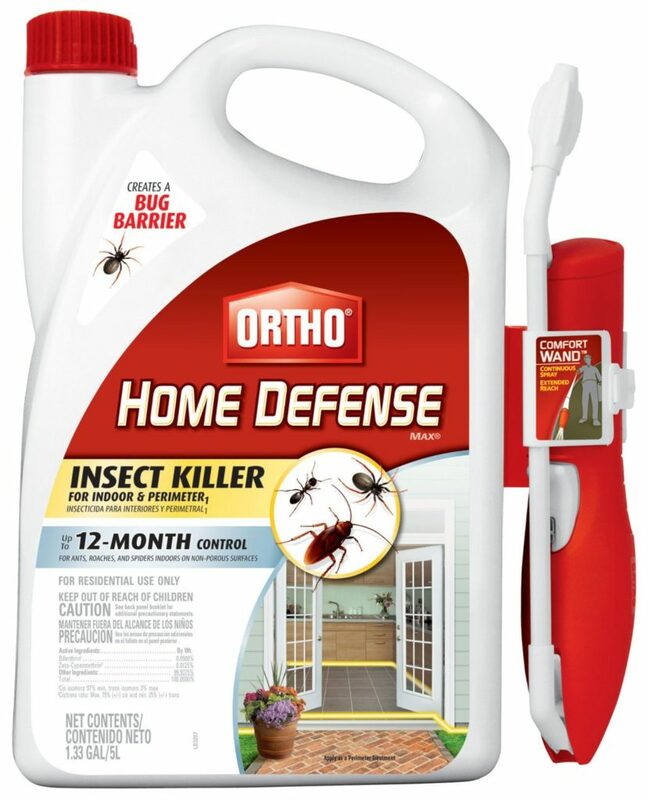 So I talked to a few different people and read a lot of reviews and decided to buy Ortho Home Defense. My sister told me this is what her neighbor (who works for a pest control company) uses and recommends as the best way to get rid of spiders and insects. You can buy it at home depot or I bought mine off of Amazon. I bought the one with the wand (and I’m so glad I did), because I’m lazy and it was a lot easier to use. You just push a button and spray wherever you want straight from the container. If you don’t want to spend that much, you can can get it without the wand and it’s a little cheaper. Either way, it’s definitely cheaper than paying someone to come do it for you and it says it will last for up to a year before you need to re-spray. I sprayed it around the outside perimeter of our home and then all a long the edges of the inside of my home (odor free and no staining). I paid particular attention to all the seals of doors and windows and areas where water is. After I finished spraying, I set out 5 brand new traps to really test how well the spray worked. Within days, I was already noticing a big difference. There were dead spiders and bugs a long the seals of our front door and in other random places around my home, which I didn’t mind because dead spiders are much better than alive spiders 😉 (Before you hate on me too much for being a spider killer when they are so great and beneficial to our outside environment, just know that I am fine with them outside in there home, but inside my home is no bueno). This stuff has worked MAGIC. And what REALLY makes me happy, is this picture I took of the new trap after being out for the same amount of time as the trap pictured above. BIG difference. Most of the spiders and insects didn’t even make it to the traps before dying. So yes, I do find dead spiders and bugs occasionally a long the edges that have died after walking across where I’ve sprayed but I just vacuum them up every time I vacuum and I’m happy as can be doing it. So this insect killer has 2 enthusiastic thumbs up and 5 gold stars from this girl! 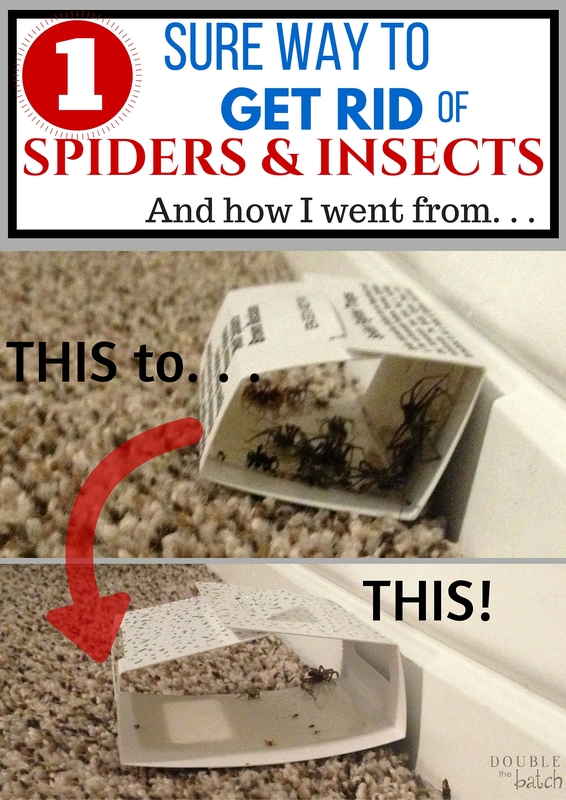 Definitely worth buying if you are having insect/spider issues as well. Trust me, you need this. 😉 The nice people at Ortho are not paying me to put on the parade of praise for them (though this post does contain Amazon affiliate links), but they should because can you read the passion in my typing?! Obviously, I’m mainly focused on being rid of spiders but this stuff kills all sorts of insects (including ants. I haven’t run into any ants so far and I have a baby constantly leaving crumbs everywhere).